In the top right corner of Location Info page there is "Actions" button. 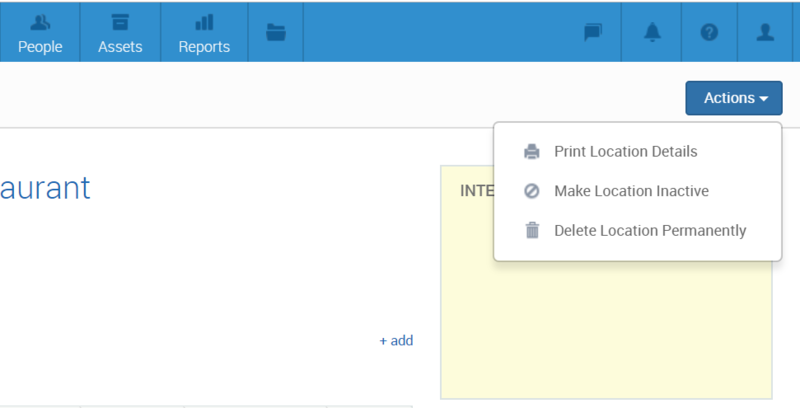 This has three options - Print Location Details, Make Location Inactive and Delete Location Permanently. Making a location inactive means that it still remains in your database but you can't perform any of the usual site actions (for example create shifts) for it and also it won't show up in your Schedule view and other pages that display your sites. After making a site inactive, you find it on the Inactive Sites page. To make a location active again, just click on the site name in the Inactive Sites list, click on Site Actions in the top right corner of the page and choose "Make Site Active". Doing this will remove the site from the "Inactive" list and you can perform all the usual actions with it again. Deleting a location permanently means that all traces of it will be deleted from the system and you won't be able to access any of the details connected to this location anymore. This was the last article in the Location section! In case anything is still unclear, the links to all the articles are below. Also, remember that if you've got a question or problem our Helpdesk can't solve, you can always email us at support@parim.co.uk and we'll be happy to help you out!